Anna Auerbach (on the left side) – Anna is a former McKinsey consultant and social impact COO. She is a Harvard Business School grad who learned her first lesson in entrepreneurship when she moved to the U.S. as a refugee at age 6, knowing just one word of English. Anna loves strategy and always sees the big picture. She is a mother to Asher, age 3. 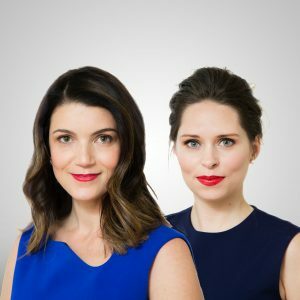 Annie Dean (on the right side) – Annie is a recovering corporate real estate attorney with an eye for style and a passion for product development. She spent six years in Big Law closing billions of dollars of real estate deals for institutional lenders and equity owners. She is fascinated by simple answers to big questions. Annie is a mother of two in New York City. Editor’s Note: This opinion piece is part of the Special Focus “Women’s Leadership in the Workplace of Tomorrow”. In the S&P 1500 today, there are more CEOs named John than female CEOs altogether. Though women have fought for and earned the same rights and privileges as men, they have yet to reach the highest levels of leadership—not just in business, but in all industries across both the public and private sectors. For years the narrative has remained largely the same: female employees should work harder, advocate more, learn better negotiation skills, find a mentor, etc. But after analyzing every piece of data on women in the workplace and speaking with thousands of women and companies for over a year, our research yielded a different result: workplace flexibility is the easiest and most cost effective way to retain women in the workplace, advance them to positions of leadership over time, and ultimately close the gender gap. 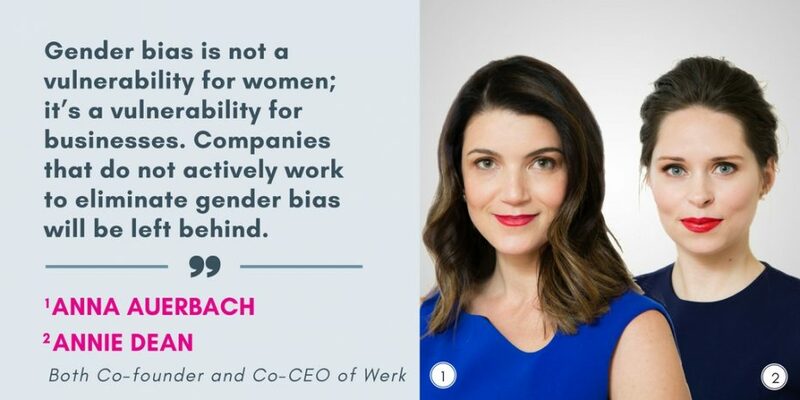 That’s why we founded Werk, the first and only job marketplace of flexible, career-building opportunities targeted to talented women. A recent study concluded that women value flexibility more than any other metric during a job search. Lack of access to flexibility has significant consequences, especially among working mothers who tend to fail without it. Of the 30 percent of talented women who drop out of workforce, 70 percent say they would still be working if they had flexibility. Companies are only just beginning to understand that flexibility is a strategic tool, not an accommodation or a lifestyle perk. A recent study published by an Assistant Professor of Sociology at Furman University, Christin Munsch, claims that we should be hesitant in assuming [flexibility] is effective [to advance equality in the workplace].” She argues that the potential backlash from biased employers could potentially leave women vulnerable and exacerbate gender inequality. We respectfully disagree. Gender bias is not a vulnerability for women; it’s a vulnerability for businesses. Companies that do not actively work to eliminate gender bias will be left behind. The market demands that companies will—at a bare minimum—provide non-hostile work environments for professional women. Companies that fail to do so face real business and financial consequences. Women who are discriminated against in the search for flexibility will take their talents to forward-thinking companies who are strategic in their prioritization of women’s advancement. This drain can be costly: gender diverse companies improve by every metric and are 15 percent more likely to outperform their peers. Companies with gender bias may also face reputational and financial consequences as the result of leaks and litigation. Companies are now being required to demonstrate their commitment to gender diversity, which is measured with tools such as the Bloomberg Gender Diversity Index. Bias against women who request flexibility typically occurs because employers assume they are not serious about their careers—but the opposite is true. Women request flexibility because they want to remain in the workforce and are investing in themselves. Employers are slow to understand that women who want flexibility are ambitious because strategic flexibility programs are not widely available. With proper implementation, flexibility can greatly improve an employee’s experience within an organization, resulting in increased loyalty, higher productivity, and better results. We must encourage employers to educate themselves on flexibility and give female employees the opportunity to succeed in a new way. While implementing new technology like online development and training can certainly help facilitate flexibility, it’s not the only change that must occur within an organization. Far too often, flexibility programs are underutilized or fail entirely because flexibility is misunderstood. In fact, 80 percent of companies already offer some form of flexibility—but the uptake is shockingly low. Flexibility isn’t simply working from home via video conference; it’s a fundamental shift in the way we think about work. Cultural and structural change takes time and must begin at a grassroots level. That’s where Werk comes in. We work directly with employers to pre-negotiate flexibility so applicants know upfront if a job is compatible with their lives. Using our proprietary Flexiverse(™), employers can effectively communicate the types of flexibility they offer, and employees can filter by the types of flexibility they need. Not only does our platform reduce a major pain point for women in the job search, but it also normalizes the conversation around flexibility and eliminates the bias women often feel during the interview and hiring process. At Werk, we don’t just believe that flexibility is the future of work for women; it’s the future of work for everyone. Today, two-income households are the norm, but traditional workplace structures have not evolved to meet the changing needs of our diverse workforce—and it affects us all. By embracing flexibility, we can create a happier, healthier, and more diverse workforce. With flexibility, we can close the gender gap for good. Welcome to the EVE Program webmagazine! Here’s where you’ll find all the latest news about women's leadership, best practices, initiatives, empowerment, personal development, testimonies, and much more, from the program's participants. Our motto: be yourself and unleash your potential. Danone in the rankings of the Bloomberg Gender-Equality Index (GEI) for 2019! Relive our Twitter Chat "Unlocking Leadership Opportunities for Women in Africa"
EVE Africa, the key figures of the 2nd edition! Join Us! Get the latest and freshest content on women leadership, gender equality, transformation of the organizations ... by suscribing to the EVE newsletter!